Amp Resources has plans to construct a new binary facility-up to 69 megawatts-at its Cove Fort, Utah operation, formerly known as the Harry Bonnett Geothermal Generating Station. The expanded Cove Fort facility is expected to commence commercial operations in 2007. There's significant growth potential in geothermal power generation, and a Utah company, Amp Resources, is confident that it can be particularly competitive in geothermal because its technology can generate up to 40 percent more power. Man-made geothermal reservoirs located beneath the earth's surface could supply five to 10 percent of the world's electricity by 2020, according to the Geothermal Education Office (GEO) in the U.S. Added to this is that the cost of generating power from geothermal sources is coming down. The GEO says, as a result of government-assisted research, the cost of generating geothermal power has decreased by 25 percent over the past two decades. It's considered a renewable resource--by no less an authority than the United States Department of Energy. But countries tapping into this alternative energy resource from the heat generated by the earth's core have so far largely focused on the low hanging fruit. 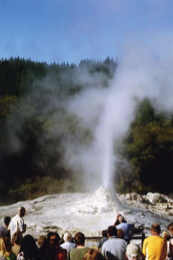 There are obvious areas of geothermal activity where heat from the earth's core rises closer to the earth's surface, resulting in volcanoes, geysers, mud pools, and an assortment of other geothermal manifestations. In fact, there are few places on the earth where there is no indication of geothermal activity, leading many to speculate about the enormous potential of this relatively clean energy resource to meet the globe's future energy needs. Three to six miles below the earth's surface, scientists know there is a vast heat resource, but it exists without the superheated water resource that today is extracted from shallow hydrothermal reservoirs to power electrical generators. The U.S., Australia, Japan, England, France, Germany and Belgium have experimented with piping water into this deep hot rock to create more hydrothermal resources for use in geothermal power plants. Furthermore, as drilling technology improves, allowing for even deeper drilling, geothermal energy from hot dry rock could be available anywhere, not just in the obvious, shallow areas. That's what the future could hold for geothermal energy. For now, companies like Utah-based Amp Resources are using the considerable amount of geological research--including data generated from exploratory oil and gas drilling programs--to pinpoint economical geothermal targets. The company then conducts an extensive analysis program using the expertise from two of its subsidiaries, Willowstick Technologies and Recurrent Engineering, to analyze promising underground resources and implement viable power generation projects. Amp Resources president Frank Wright notes that legislation in several western states requiring that a certain percentage of power must come from renewal energy sources has "helped the renewable energy industry very, very substantially." Over 8,200 megawatts of electricity is currently being produced by 250 geothermal power plants operating in 22 countries, providing power to 60 million people. The United States is by far the largest producer of electricity from geothermal sources. It generates over 2,850 megawatts from this energy source, followed by the Philippines at 1848 megawatts and Iceland at 1,443 megawatts. Electricity generated from American geothermal sources is supplying consumers primarily in California, Utah and Nevada, which should come as no surprise considering the extent of geothermal activity in the Western United States. What's not widely known is that the electrical energy generated in the U.S. from geothermal resources is more than from solar and wind combined. It's estimated that there are over 270 communities in the Western United States that are close enough to geothermal reservoirs for potential implementation of geothermal district heating. The geothermal power beneath the earth makes for great tourist attractions (above), but it also holds great potential. Man-made geothermal reservoirs beneath the earth's surface could supply five to 10 per cent of the world's electricity by 2020, according to the Geothermal Education Office. Amp Resources has been in business since 2002. It develops geothermal and waste heatenergy projects, licenses proprietary thermal power cycle technology, delivers specialized engineering design services and turnkey energy solutions. While other geothermal power developers have been around longer and have more plants in operation, "I believe we are viewed as the company that is reviewing and implementing the latest technologies," says company vice president Lyle Ball. "We are not beholden to entrenched systems, but are pursuing the latest and greatest technologies. We have a fresh approach." The company has acquired four development projects in the Western United States, located in Cove Fort, Utah, Salt Wells, Nevada, Stillwater, Nevada, and Surprise Valley, California. One project is currently generating power, while the others are in development. Amp Resources is actively pursuing growth, making it known that it is interested in finding new development projects. "Expansion is fuelled by the availability of power purchase agreements," says Wright, "where you can go out and economically do a viable project. Without a power purchase agreement, you don't have a project. "Power purchase agreements," he adds, "are available." Another important consideration, he says, is how close the project is to existing transmission lines. "Obviously, closer is better. Having to put in a transmission line is an inherent cost." Since the first geothermally-generated electricity was produced in Larderello, Italy in 1904, three power generation methods have developed. These are flashed steam plants, dry steam plants, and binary power plants. Wright says most plants being built these days are binary power plants because this technology can economically produce power from more abundant, lower temperature geothermal resources. The largest number of existing geothermal power plants are flashed steam plants, where hot water from production wells passes through one or two separators. Having been released from the pressure of a deep reservoir, it "flashes" to steam. The force of the steam is used to spin a turbine generator. It should be noted that the temperature of water in productive geothermal reservoirs is typically between 200 and 700 degrees Fahrenheit (F). Some geothermal reservoirs produce mostly steam, thus creating the opportunity for the development of a dry steam plant, where the steam shoots through a rock catcher and into the turbine power generator. The Geysers dry steam reservoir in northern California is the largest known dry steam field in the world and has been producing power since 1960.
contact with the blades of the turbine generator and is used from water-based geothermal resources of approximately 200 to 360 degrees F. In the binary system, warm geothermal water is pumped to the surface and channeled into a heat exchanger. The geothermal water is then used as a source to heat another "working fluid," which then vaporizes to turn the turbine generator. Amp Resources is confident that it can be competitive generating power from geothermal resources because it says its Kalina cycle technology can effectively use binary geothermal generation facilities that make up to 40 percent more power than traditional technologies for the same hardware costs. However, Wright cautions that no two geothermal resources or projects are the same, so the ability to achieve 40 percent more power won't apply in all circumstances. The Kalina technology employed by Amp Resources was developed by a Russian-born scientist, Alex Kalina, who realized that using a working fluid with a lower boiling point delivered more power for the same amount of input heat, thus creating a more efficient power generation system. Amp Resources uses a proprietary process that modifies and improves on the Kalina system, using an ammonia and water mixture as the working fluid. "Highly controlled changes to the composition of an ammonia and water working fluid allow the power generation cycle to generate power over a broader range of temperatures," says Paul Stephan, president of Amp Resources subsidiary, Recurrent Engineering. The binary method also has the advantage of producing zero emissions, as the water resource is carefully re-injected into the ground formation to cycle through the system all over again. The Geothermal Education Office says geothermal energy has the potential to deliver a significant environmental dividend through reducing dependency on such energy sources as fossil fuels and nuclear. The current installed geothermal electricity generation capacity around the world is equivalent to the output of more than 10 nuclear power plants. Also, direct uses of geothermal water worldwide avoids the combustion of fossil fuels equivalent to burning 830 million gallons of oil or 4.4 million tons of coal per year. Worldwide electrical production from geothermal reservoirs avoids the combustion of 5.4 billion gallons of oil or 28.3 million tons of coal. Geothermal water has other uses besides generating power. One of its most recognized uses is in hot springs and health spas. The heat from the geothermal water can also be used to heat greenhouses, shorten the time needed to grow fish, shrimp, abalone and alligators to maturity, pasteurize milk, dry onions and lumber, and wash wool. 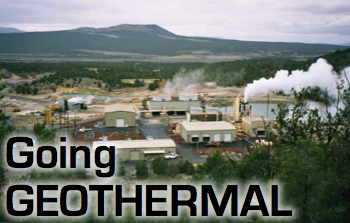 Some communities near geothermal sites use the geothermally-heated water for district heating. The water is pumped through a heat exchanger, which in turn transfers its heat to clean city water that is piped to buildings in a district. Once there, a second heat exchanger transfers the heat to the building's heating system. The first modern district heating system was developed in Boise, Idaho.